We love watching people walk into our store and taking in all of their choices. In many cases, they automatically move towards the natural stone displays. It’s beautiful. It adds a touch of elegance. And it’s impossible to ignore the styles and patterns that come with natural stone. What’s more, you can install natural stone in so many rooms, in so many ways. Why not consider it for your home? Yet there are a few things to consider before you make your final selection. It’s easy to get sucked in by the beauty of natural stone. But every selection has its own characteristics. 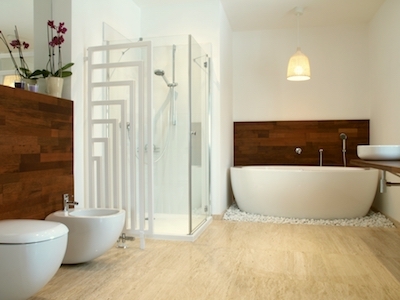 Granite is beautiful as a countertop, but would it work equally well in the bathroom? Or how about travertine; is it the right choice for your kitchen floors? Be sure to consider how you’ll use it, and what’s the most practical choice to ensure everyone in your home has a good experience. It won’t take you long to discover each type of stone has its own pros and cons. Sizing also can have an impact on the final appearance. Large tiles are becoming all the rage right now. It means less grout, which can give you a cleaner appearance. Or maybe you use complimentary tiles and colors and continue the look from your floor to the counter, to the backsplash, and even into the shower. Don’t forget mosaics and other designs to create a unique look. Every flooring choice has its own unique maintenance routine. Natural stone is no different. Some require a specific maintenance routine while others may require a once a year sealant to keep it from staining. Just because the manufacturer recommends something, doesn’t mean you should keep an eye out for updating the routine – a home with several kids and pets may need more maintenance than an individual whose only home on weekends. Is natural stone the right choice for your home?